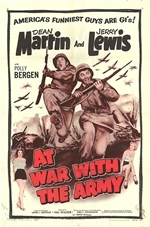 At War with the Army is a 1950 musical comedy film directed by Hal Walker and starring the comedy team of Martin and Lewis and introducing Polly Bergen. It was filmed from July through August 1949, and released on December 30, 1950 by Paramount. It was re-released in 1958 by OMAT Pictures. Although filmed before My Friend Irma Goes West, it was held back until the sequel to Martin and Lewis' smash film debut My Friend Irma was released.